"I have no connection or contacts whatsoever with the State of Florida." "I swear under penalty of perjury that the testimony set forth in this declaration is true and correct." "This 24th day of August, 2003. Stephen Joseph Jared"
So declared one Stephen Joseph Jared a/k/a Joe Jared from Orange, California under oat in this sworn declaration signed on August 24, 2003 in federal Case # 03-80295, United States District Court, Southern District of Florida. While Joe's declaration is just a routine paper prepared by his lawyer in a much more complicated legal machination, it just so happens that Joe knowingly committed perjury by swearing and signing on the dotted line. "I have no connection or contacts whatsoever with the State of Florida. Specifically, I do not own real or personal property in Florida. I have never lived in Florida and do not knowingly engage in any business transactions in Florida or with Florida companies or residents. 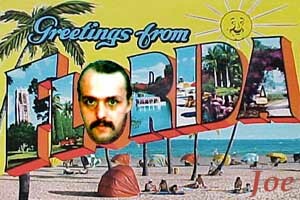 I have never been to Florida, other than __________ ." While we believe Joe does not own property in Florida and has never lived here, he has knowingly engaged in business transactions with Florida companies and residents. Besides terrorizing innocent Florida businesses and residents with his collection of blacklists at relays.osirusoft.com, Joe had a name server on ip 66.33.98.17 providing domain resolution services to Osirusoft and SPEWS. The ip in question belongs to Dialtone Internet, Inc. of Fort Lauderdale, Florida, a company which on Nov 27, 2001 graciously offered their support to Joe's cause by "donating bandwidth and memory on its servers for the Osirusoft Spam Stopper service". Dialtone's CEO Alvaro Albarracin (a Florida resident, no doubt) is "pleased to donate the server space" (again, located in Florida) and proud to serve "as a responsible 'Net citizen' by making it easier for system administrators around the globe to access and use the blocking service". We are glad you have acknowledged the Florida company's valuable contribution to your cause in writing, Joe, because this gives your sworn declaration that you "have no connection or contacts whatsoever with the State of Florida" ... "and do not knowingly engage in any business transaction in Florida or with Florida companies or residents" zero credibility. This is much more than a casual contact with a Floridian. Having a server, namely dialtone.osirusoft.com a/k/a ns4.osirusoft.com physically located in Florida conveys Osirusoft and SPEWS a business relationship and presence in this state (the Florida server on ip 66.33.98.17 was also a name server for spews.org). Can you say PERJURY? Can you spell J-U-R-I-S-D-I-C-T-I-O-N now? Good! Anti-Business Cyberpunks Hold e-Dispatch Readers Hostage! All material published on this site is for information purposes only, and should not be considered legal advice.